Aung, the troupe's elderly singer, must navigate the labyrinth of court intrigues to solve the mystery and appease the angry spirits: goals which might be at odds. Assisting him - or is that, hindering? - is the troupe's enthusiastic but youngest puppet. I'm embarrassed to admit that it would take me quite a while to find Burma on a map, and that my knowledge of Burmese culture is . . . well, let's just say it's nothing to brag about. Which means I didn't really know at all what I was in for when I started Death by Effigy. Its entire frame of reference is different from my own. I did my best to shut off the analytical part of my brain, though, and simply enjoy the ride through unfamiliar terrain. The Foreward contextualized the story by providing a short summary of the cultural and religious history of Burma leading up to the time period of the novella, painting such a fascinating picture of the country's past that I honestly would have loved if it had been expanded to fill the entire book. 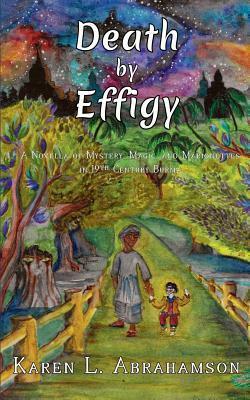 Death by Effigy is an engaging, unique little novella, featuring–of all things–an old puppeteer and an ancient (though carved to be silly) living puppet as the protagonists. I would normally have taken issue with some of the outlooks espoused by characters in the story (especially Aung's sense of revulsion upon finding his childhood sweetheart has become a Christian, and the central plot of a royal wedding in which a polygamous old king is marrying a thirteen-year-old!). But I managed to shut down the parts of my brain that were offended by such things and simply focus on enjoying the story I was being presented with and appreciating the glimpse into a culture I don't usually know anything about. Once I put the book down I took a moment to recognize and acknowledge that I don't agree with these parts of the story, but as long as they are truly authentic I wouldn't choose to remove them; it's important to honestly represent the attitudes and practices of other peoples–even if the idea of a thirteen-year-old girl marrying anyone turns my stomach. Actually, speaking of honest representation, I should point out that the author is not actually Burmese, but is Canadian. The book's tone and content "feel" authentic to me, a complete novice, and the author sounds like she really did her research in the Foreward, but without talking to people actually from that culture I don't know for certain that it really reflects the culture or lifestyle of 19th-century Burma. All in all, Death by Effigy was an engaging story that held my interest, exposed me to a little piece of the world that I'm unfamiliar with, and offered an exercise in setting aside my own worldview to fully enjoy my foray into a new one. Its short length made it a quick and painless read, never lagging (though I did have trouble telling some of the puppeteers apart) and the story was an interesting and engaging one. I'm glad I had the chance to read it. Disclaimer: I received a complimentary copy of this novella from the publisher, who is a family friend. Thanks. The author is Canadian. She lived in Myanmar (current name of the former Burma) and studied with a puppet maker, so she knows the traditions of the craft. The Foreword is written by another author, who is a historian specializing in Burmese history, and also a fantasy writer. He has a wonderful story in my Myriad Lands anthology about a young Buddhist monk, and clearly knows the history of the region, so I thought he would be a great choice to write an introduction to the area. What really comes across is in the Foreword is the many migrations of peoples and religions who have moved through the region over the centuries, a feature which comes across in the story (like the conversions to the new upstart in the country, Christianity) and is driving events today (like the Rohingya crisis).